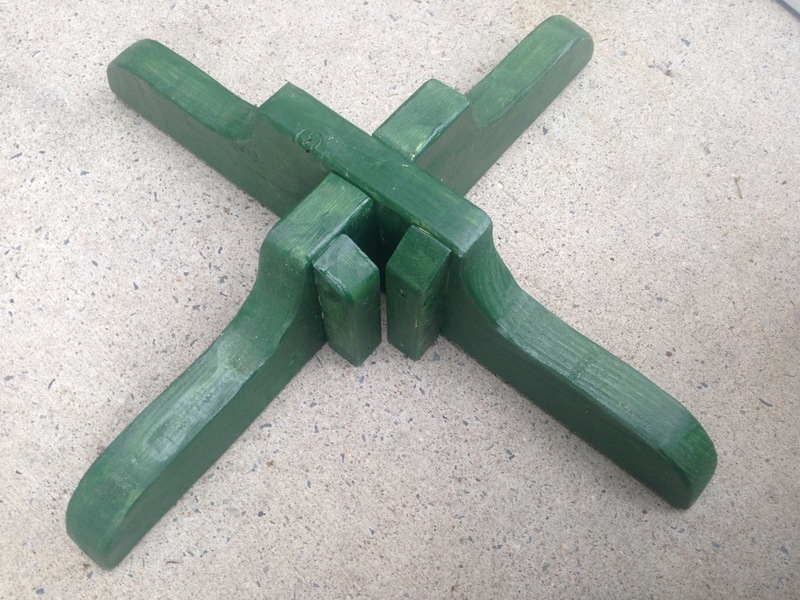 Common 2×6 (1.5”x5.5”), two pieces 24” long per pole, used to form the legs. Common 2×2 (1.25”x1.25”), one piece 36” long (or whatever height you want your poles) plus two pieces 5.5” long. 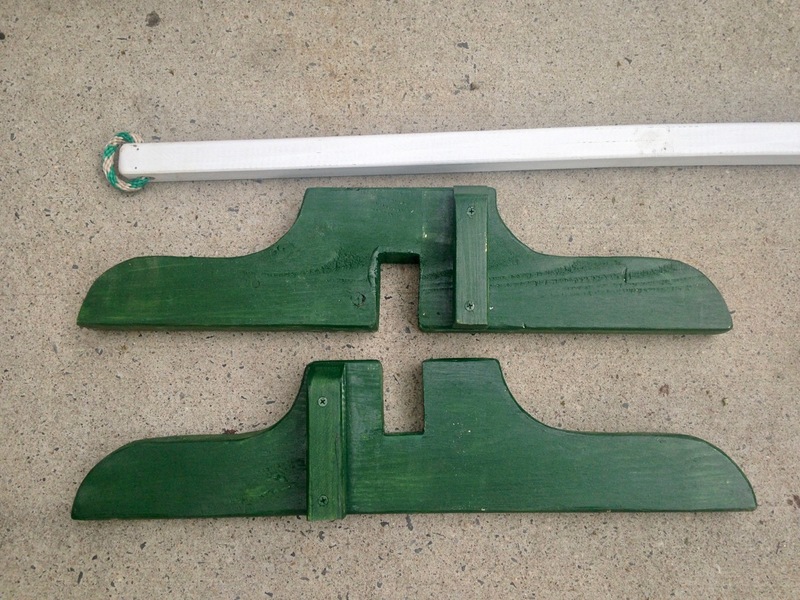 Paint or varnish, approximately 2oz per unit, whichever color or style you prefer. 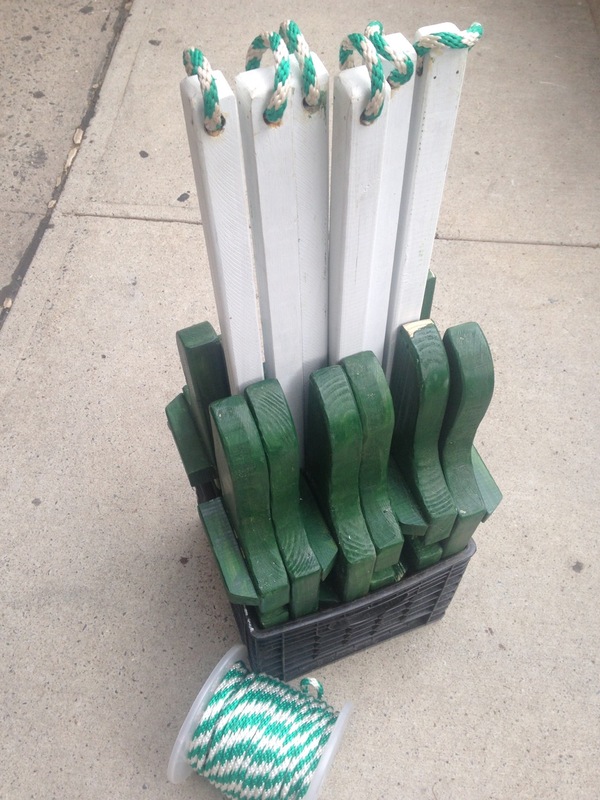 We painted the legs green and the poles white, but any colors would work. 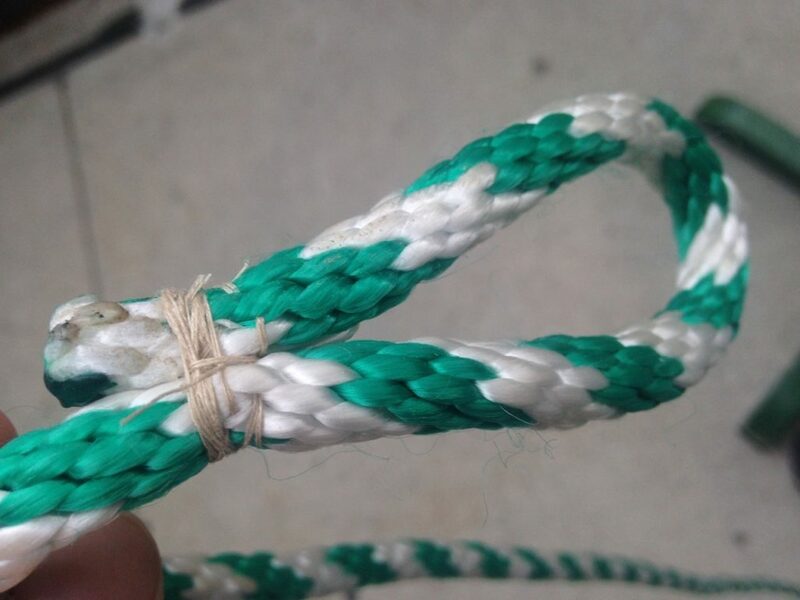 Rope or cord of some sort; I bought 100′ of 3/8” braided poly “derby” rope in our provincial livery colors. Cut lumber to length. Optionally cut one end of each 5.5” piece of 2×2 at a 30° angle. Cut rounded corners off of each leg board. A suggested pattern is attached in PDF format. This is optional but recommended; it makes the legs lighter, less obtrusive, and more attractive. Cut a 1.5” x 2.75” notch out of the center of each leg board. Make sure to produce alternating pairs, one notched on the top and one on the bottom. Sand leg boards smooth, rounding over any sharp corners. 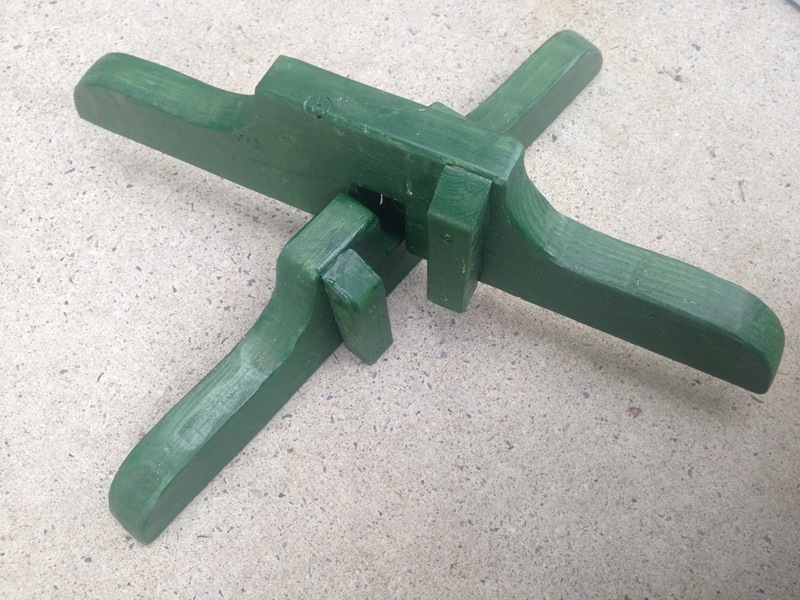 Test fit them together in pairs, sliding the notches over each another, and sand, file, or chisel away any additional material required to let them slide easily into place. 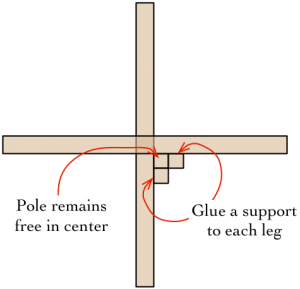 Assemble pairs of legs, place the pole upright in corner where they meet, and glue a short piece of 2×2 to each leg, surrounding the pole. 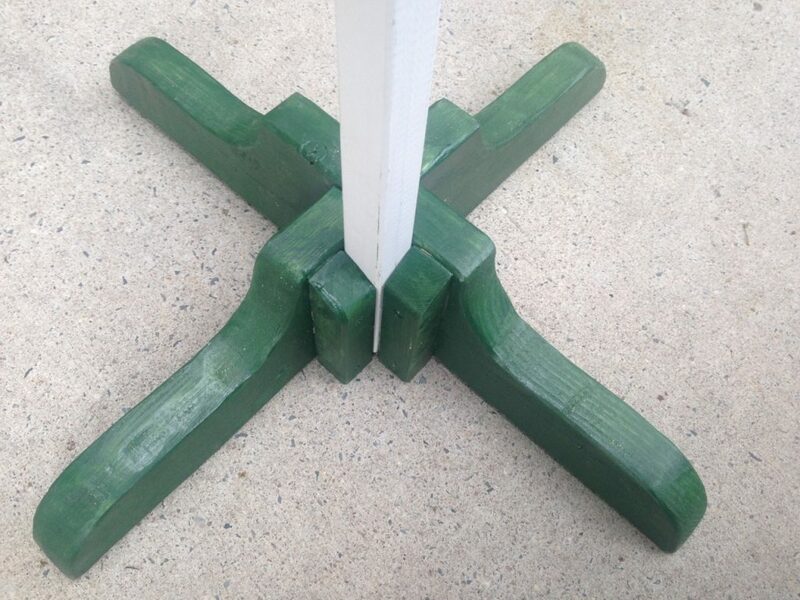 Do not glue the pole into place, and don’t glue the legs to each other! Repeat for each pair of legs, being consistent about which side of the crossing the supports are glued to so that any of the upper legs can be used with any of the lower legs. 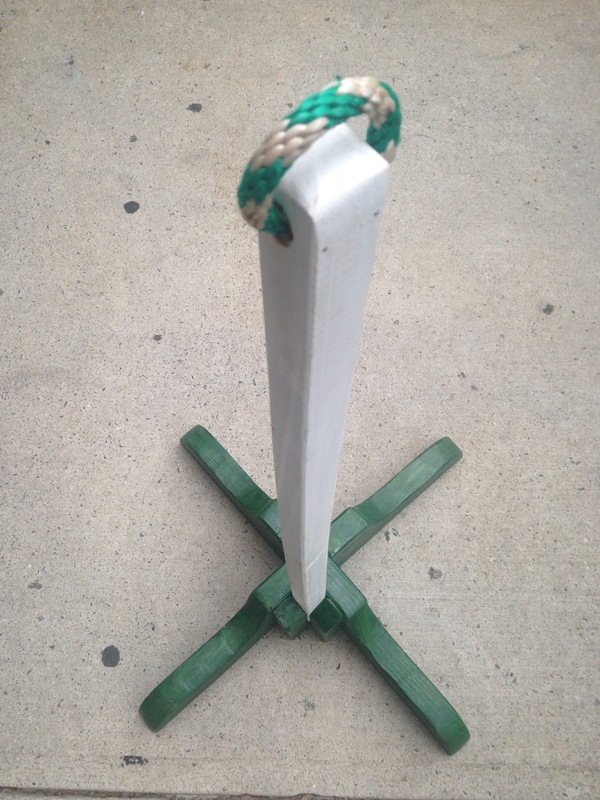 Drill a 0.5” hole through one end of each pole about 1.25″ from the top to hold the rope. Paint everything and allow to dry thoroughly. 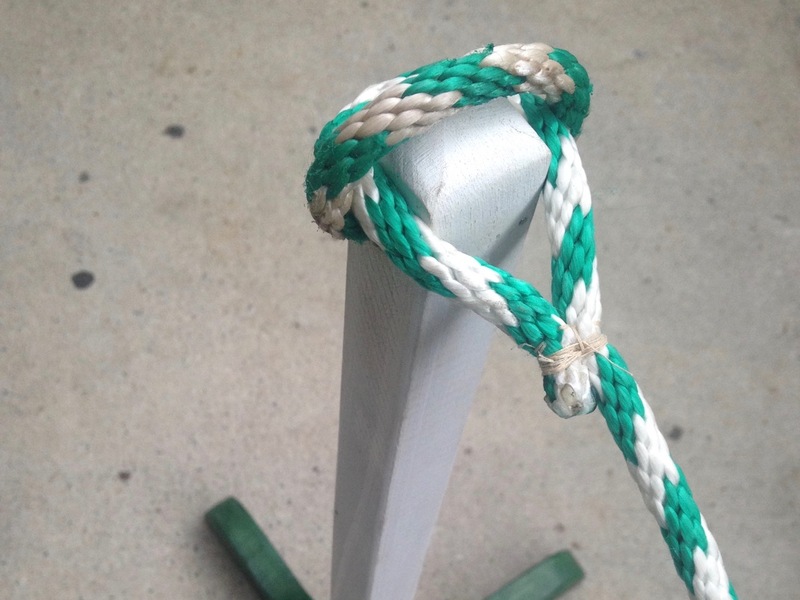 Optionally cut 7″–7.5″ lengths of cord, feed them through the holes on the end of the posts, and bind into a loop. I did this by roughly stitching the ends together with some thread, covering the junction with glue and rotating it into the hole, then tapping a small nail through the pole on each side to pin both ends of the rope into place. 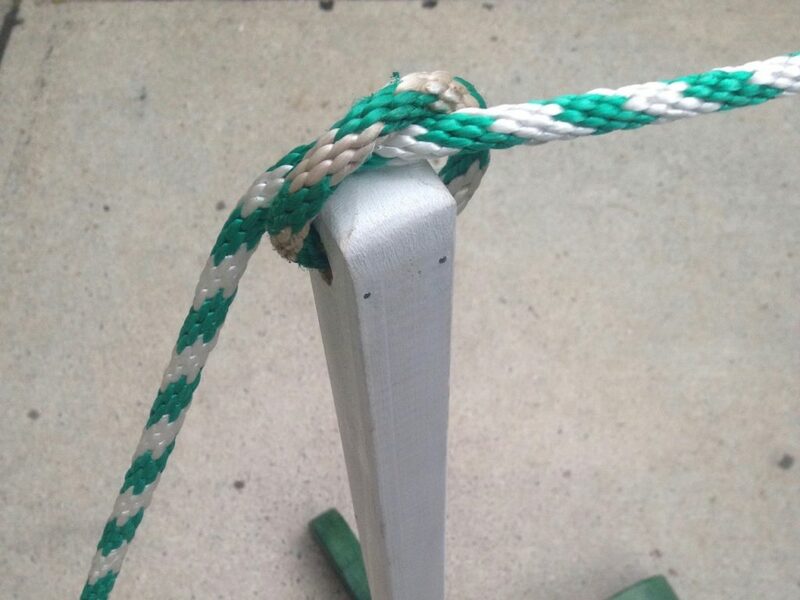 This is optional, as you could just feed the list rope through the hole, or tie it around the top of the post, but the loop allows the list rope to slide through smoothly or be bound in place as shown below. 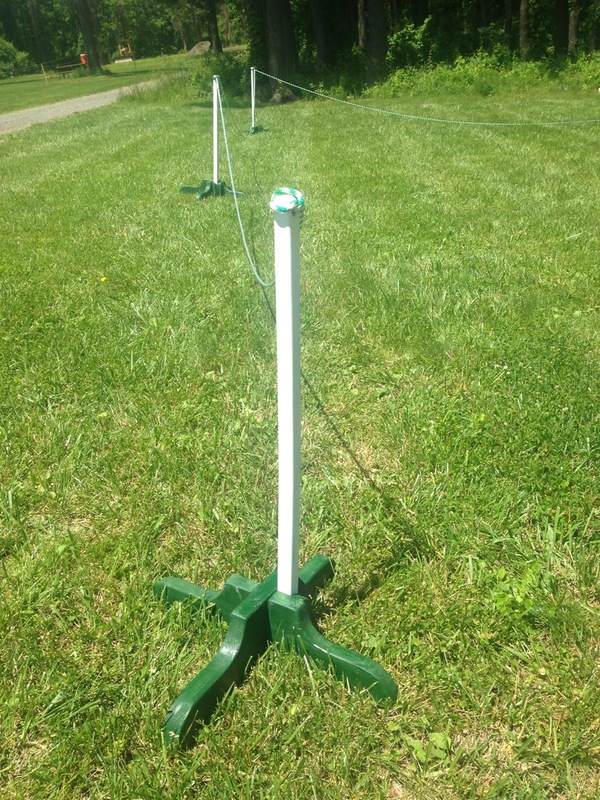 Select a pole and a pair of legs with alternating notches. Line up the notches and slide the legs together. Fit the end of the pole into the resulting pocket. Feed the list rope through the loop at the top of the post. 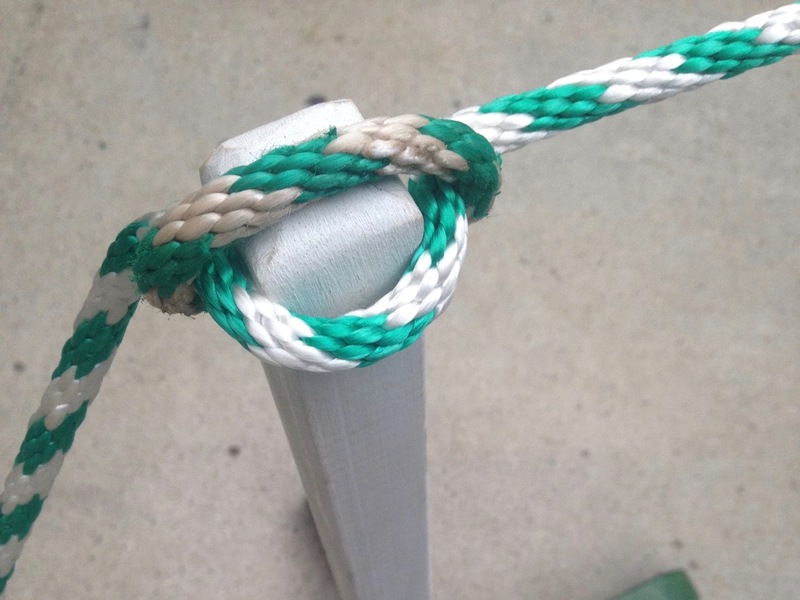 Alternately, bring the list rope along the side of the pole, gather a small bend of it and feed it through the loop, then wrap it around the far side of the pole. 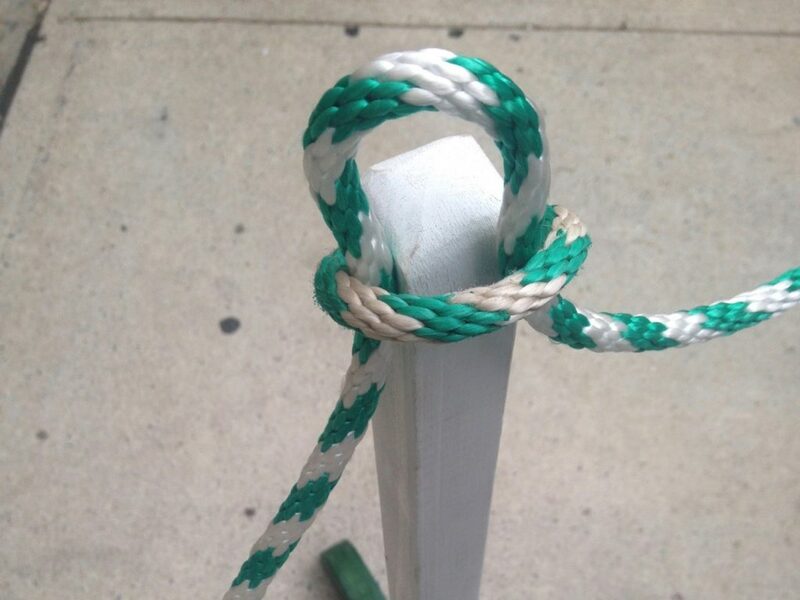 Finally, if you bind a loop into the end of your rope, you can simply set it around the top of one of the poles. At the end of the day, the pieces can be slid apart and packed into a crate for transport. We found that with a bit of careful packing, all six poles can be stood on end in a common 13″ storage cube (or milk crate). I’m pleased with how these turned out. They’re attractive and fit in to the scenery at an event without a problem. I made the holes on the top of the posts a little too close to the ends. 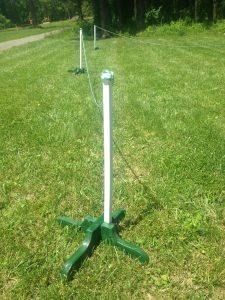 The holes I drilled were about 0.75″ from the end, but moving it a half inch lower as suggested in the instructions above (and making the rope loops an inch or so longer to match) would have provided more room to loop a cord around the top of the post.